CEDAR RAPIDS, Iowa — Elizabeth Warren seemed to answer for herself on Sunday the question each campaign is internally debating: How should a Democratic presidential candidate respond to the volatile attacks hurled against her or him by President Trump? In the first three minutes of her Iowa kickoff as an official presidential candidate — on the morning after the president taunted her in a tweet — Warren did not sidestep the president's attacks, instead countering to a supportive crowd of about 200 Iowans that President Trump could soon wind up in prison. "By the time we get to 2020, Donald Trump may not even be president," she said from the stage. "In fact, he may not even be a free person." Over the course of a single weekend, four contenders for the Democratic nomination tried different ways to address Trump on the stump, from taking him head on to ignoring the president altogether. Trump, for his part, seems eager to engage from the confines of his Twitter account, firing off insults to two of his potential 2020 opponents over the weekend — Sens. Warren, D-Mass., and Amy Klobuchar, D-Minn.
After Warren officially announced in Massachusetts on Saturday, Trump referred to her in a tweet as "Pocahontas" and followed: "See you on the campaign TRAIL, Liz!" And he then snarkily tweeted that Klobuchar "looked like a Snowman(woman)" during her announcement amid a Minnesota snowstorm on Sunday. Klobuchar fired back in a tweet of her own on Sunday night, questioning a particular physical feature: "I wonder how your hair would fare in a blizzard?" 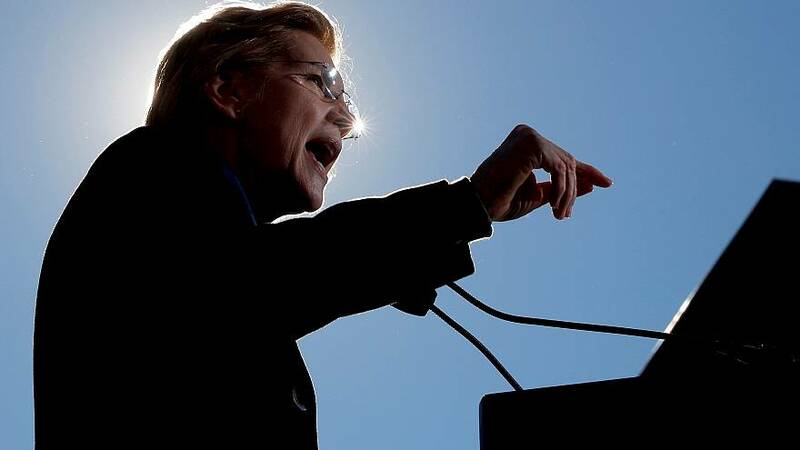 As one of the Democrats' top contenders, Warren, again, chose over the weekend not to ignore Trump's persistent attacks on her, and, in turn, lent Democratic activists intent on removing the president from the White House a leading voice to echo. "One of the things we're going to have decide about campaigns going forward is what Donald Trump does everyday — a racist tweet, a hateful tweet, something really dark and ugly," she added, openly pondering the dilemma for candidates. Yet despite her opening crack, she then urged Democrats to not "respond on a daily basis" to the president and, instead, "talk about what we understand is broken in this country, what needs to be done to change it, and talk about how we're going to do that." Sen. Cory Booker, D-N.J., at multiple Iowa stops on Friday and Saturday, pleaded with rally goers at his events to not take that mantle. He urged, for strategic purposes, other Democratic candidates to not undercut one another or respond in kind to Trump's insults. Democrats rode to sweeping midterm victories from coast to coast to retake control of the U.S. House of Representatives, in part, on messages that largely avoided Trump altogether, focusing instead on issues such as health care. "If we try to fight Donald Trump on his turf, not only will both of us get muddied, but the country suffers as a result," Booker said on Saturday in Marshalltown, Iowa, continuing: "We have got to stop in this country thinking that to be tough you have to be mean, to be strong you have to be cruel. That is a lie. The most powerful force in this universe is defiant love." Klobuchar steered clear of mentioning the president's name directly during the snowy event in Minneapolis. Instead, the president was present in euphemism only. Klobuchar lamented the "petty and vicious nature of our politics," and decried a practice of "foreign policy by tweet" to cheers from thousands in the crowd. By contrast, Sen. Kirsten Gillibrand of New York has not yielded the floor to the president, refusing to shy away from her criticisms of Trump. At a happy hour hosted by the New Hampshire Young Democrats in Manchester, she listed the ways in which Trump had divided people. "And that's why I'm so angry at what President Trump has done. Putting hate and the division into this country. It's terrible. It is not who we are as a nation," she said. "And so every time he draws a line, whether it's on racial lines, religious lines, socioeconomic lines, he's dividing us and he's making us weaker not stronger." The New York senator spent a significant amount of time denouncing Trump's moves to ban transgender people from serving in the military and called his southern border policy inhumane. "What is so disturbing about President Trump is the way he has dehumanized people seeking our help," said Gillibrand as she periodically sipped on a house brewed beer. "I don't know why this president has to be so afraid of immigrants and refugees. That is not our story, that is not who we are. It is an outrage." At a town hall in Des Moines in late January, Sen. Kamala Harris, D-Calif., did not name Trump at any point but critiqued multiple policies held by "the administration." And South Bend Mayor Pete Buttigieg told reporters after an event in Johnston, Iowa, this weekend, that he is avoiding focusing on the "characters or the horror show that is going on in D.C. right now" because voters should be presented with an alternative message of ideas.